Any head of procurement who has worked in government will know that effective procurement is a top priority in the public sector. But are you doing all you can to maximise the savings available?This year, Grosvenor collaborated with PASA to survey hundreds of top procurement professionals in Australasia (including a large number of federal and state government organisations) to identify where the next wave of procurement savings will come from. It’s been called a lot of things: strategic procurement, Category Management, strategic commissioning and customer centric procurement. What it really should be called is “good procurement practice”. Is there a pot of gold hidden in your procurement spend? Prioritising your procurement initiatives would be a lot easier if indicators existed that helped you determine where your most likely source of savings is going to come from. How to get started with sustainable procurement? With spend in supply chains representing an average of 60% of an organisation’s budget, procurement strategy and processes have a profound ability to affect the social, environmental and economic sustainability of business at large. The power of procurement to contribute, both positively and negatively, to sustainable objectives has never been so widely recognised. Want to spend less time worrying about poor supplier performance? Supplier management is often something that gets thrown at you with little explanation of what is required, little to no training in how you monitor supplier performance or avoid the biggest traps. Spend less time worrying about poor performance and more time on making strategic decisions that truly deliver value for money for your organisation. In my last article, Is there a pot of gold hidden in your procurement spend?, I mentioned that one of the goals of our 2018 Procurement Study was to unlock a set of indicators that could be used to identify which categories, supplier and contracts are likely to yield the greatest opportunities to reduce spend. It never ceases to amaze me how important the simple things like returning a phone call or responding to email are to successful buyer / seller relationships. Funny how we expect a supplier to respond and even fall over themselves when we need them. But do we always show the same respect back? Is it ok not to just because we are the ones handing over the cash? 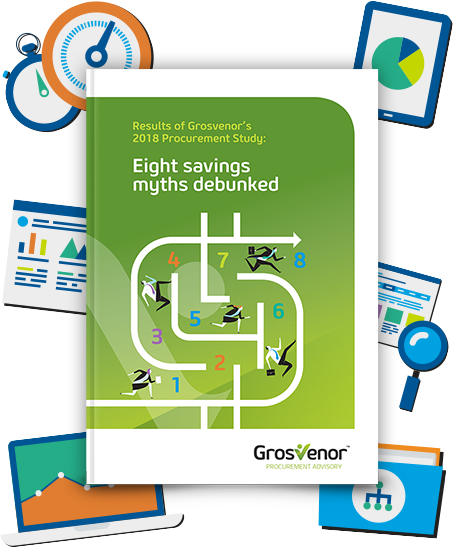 Our 2018 procurement study “Eight savings myths debunked” was expected to stir the pot. It’s easy to allow assumptions and preconceived ideas about finding cost savings to influence where to look and what to expect. With their focus on keeping supplier costs down, Australasian Chief Procurement Officers are used to having their attention trained on the external market: but did you know you can almost double your savings by turning your attention inside the organisation too? You could be forgiven for thinking that suppliers provide better performance to their larger clients. Or those that are more profitable. Or those that represent growth opportunities. After all, it would make sense that a supplier does everything they could, go the extra mile for their bigger clients. Well actually the data gathered in our 2017 Procurement Study tells us that the contract value or the size of the supplier has little impact on the level of performance the buyer receives. Modern Slavery Act – What have others implemented and what should I be doing now? Grosvenor benchmarked 31 organisations across Australia and internationally to understand what controls were in place to address the risk of modern slavery within their supply chains. Through our research in June 2018, we discovered what was considered best practice and what organisations across the country can be doing now to address modern slavery risks within their supply chains. What’s the difference between suppliers and employees when it comes to motivating for high performance? As it turns out - nothing! When you think about it, why would or should it be any different: in both situations we are talking about the motivation of human beings. We studied 159 organisations, asking them about their most successful procurement initiative in the last 12 months and benefits achieved.